Secluded and surrounded by tropical gardens, Blue Serenity is just what the name implies…serene. If you’re looking for a property that will provide you with the time and inspiration to do a little writing or art work, look no further. There are many spots around Blue Serenity that will get your creative juices flowing. If you want to spend some time on the white sand beaches, you just have to navigate the staircase at the rear of the estate to reach Secret Harbour Beach. Here you can sunbathe, walk the beach in search of shells and sea glass, or try your hand at snorkeling. If you need a little retail time, there are shops aplenty just a few miles away. Deluxe property with beach access! Walk down to the white sands of Secret Harbour Beach from this property. Blue Serenity has it all-a five-star main villa, a just-completed separate bedroom pavilion with two king master suites, and a guest cottage, all surrounded by expansive grounds and lovely gardens and set within electronic gates. 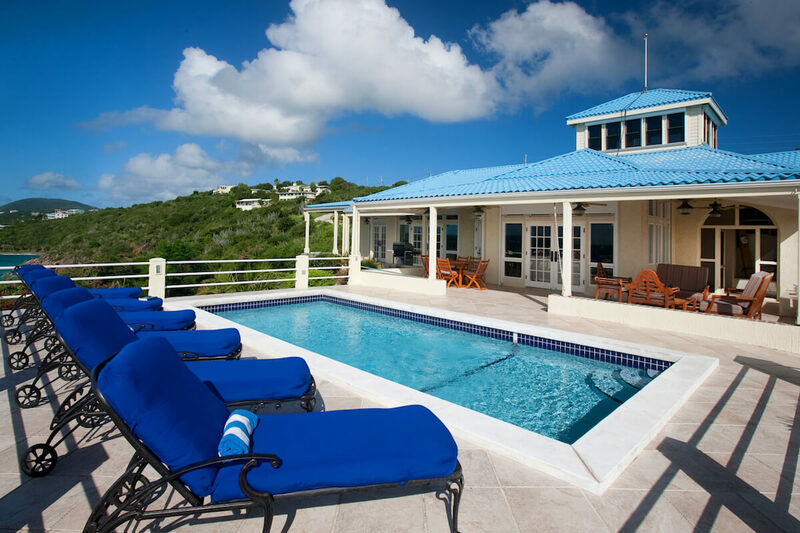 Located next to Secret Harbour Beach and Blue Moon Restaurant, Blue Serenity has a gated stone staircase which curves through gardens from the pool deck down to the beach. Guests may never want to venture out from this property. Blue Serenity’s Main Villa is built all on one level and is fully air-conditioned, with a high-ceilinged Great Room serving as the central gathering spot. The Great Room offers a sitting area, with the open-plan gourmet kitchen and a formal dining area adjoining within one convivial space. Hallways extend from either side of the Great Room, each leading to the bedrooms. On the east side of the Great Room are two bedrooms. The king master suite is furnished with fine linens and custom blinds for sleeping late; adjoining is an enclosed sitting area with table and chairs overlooking the pool and sun deck (so guests can keep an eye on the children while relaxing in the shade). The adjoining master bath is pure indulgence, with a bathtub and large glassed-in shower. Another king (OR two-twin) bedroom is off the east hallway with a full bath just across the hall. And the west wing comprises a newly-remodeled queen bedroom/bath suite. Back in the Great Room, a spiral staircase winds up to Blue Serenity’s home office, an area well equipped with DSL service and Wi-Fi for guests’ laptop, a printer/scanner, and fax machine with a dedicated line. The sitting area of the Great Room is furnished with sofas, a 55” Samsung LED flat-screen television on the wall with an adjustable arm so guests can watch from several angles, handsome native stone trim, and banks of windows fitted with electronic roll-down shutters, which easily open and close with a switch for shade and privacy. Conveniently situated between the Great Room and the king master suite is the air conditioned exercise room. Outside, via French doors opening from the Great Room and kitchen area, and from the two opposite end bedrooms, is the sun deck and swimming pool with a view of the ocean beyond. Poolside chaise lounges wait. A portion of this large deck is roofed for outdoor dining options and for shady relaxation on bright sunny days. There are two dining tables which seat up to 14 for alfresco meals. Right outside the kitchen is a handy gas grill, protected from weather by a deep overhang. And right off the pool deck on a small, secluded patio is the large hot tub. Blue Serenity has an assortment of children’s pool toys and floats available. Completed in early 2011, the new two-bedroom Pavilion located next to the Main Villa offers two air-conditioned king suites. One bedroom has an en-suite bath with granite countertops and a stone shower floor. The second king suite features a wet bar and breakfast station with coffeemaker and mini-fridge, and a lavish en-suite bath with blue granite countertops, two stone vessel sinks, a two-person Jacuzzi bathtub, and a large stone-floored shower with his-and-hers waterfall showerheads-the shower looks out to the ocean view. Both king suites have their own private decks with ocean and sunset vistas, and walk-in closets. Hair dryers and spa robes are provided. Blue Serenity is spread over 2-1/2 acres with lush landscaping and lawns dotted with shady trees and flowers, and surrounded by fencing and walls built with native bluebit stone for privacy and security. An electronic gate offers privileged access to guests, while the pool man, gardener, and other villa staff enter through a second gated entrance to the property. Blue Serenity is a showplace replete with comfortable furnishings, plentiful amenities, artful lighting inside and out, and secluded privacy, yet guests can take the staircase down to the beach for snorkeling or lunch or dinner at Blue Moon Restaurant at Secret Harbour, or drive a few minutes to varied East End restaurants, bars, shopping, more good beaches, The Ritz-Carlton Hotel and Club, and the nearby ferry dock serving St. John and the British Virgin Islands. Five stars! MAIN VILLA: 5 cable TVs (in Great Room: a 55-inch flat-screen LED TV, DVD/CD player, iPod dock + Xbox 360 Elite [please bring your own Xbox games]. In Main Villa’s king master suite: a 37-inch flat-screen TV + DVD player. In Main Villa’s king/2-twin bedroom: a 32-inch flat-screen TV with DVD player. In Main Villa’s queen bedroom: a 40-inch flat-screen TV. Main Villa also has central A/C throughout, 6-CD player with surround-sound, DVD movie collection, radio, books, games; office in tower with DSL line + Wi-Fi throughout, fax machine, printer/scanner/copier, answering machine; gourmet kitchen. New EXERCISE ROOM has A/C, a 32-inch flat-screen cable TV, a Landice L7 Club Pro Sports treadmill, a Bodycraft Fitness GLX Home Gym, Pilates equipment, exercise mat + free weights. Main Villa has a safe for valuables, gas grill, electronic roll-down shutters for shade, + dishwasher. IN NEW KING BEDROOM PAVILION: Full A/C, smaller suite has a 40-inch flat-screen cable TV with DVD player + iPod dock; larger (master) suite has a 37-inch flat-screen cable TV with DVD player, a Bose 321 stereo, wet bar and breakfast station with coffee maker and mini-fridge, + a safe for valuables. Both suites offer spa robes + hair dryers. ENTIRE BLUE SERENITY PROPERTY offers hair dryers + spa bathrobes in each bedroom; 4 Mosquito Magnets, gas grill; pool toys, beach chairs + cooler, 4 chaise lounges on beach at the foot of the staircase to Secret Harbour Beach, trash collection twice per week, UV water purification system, electronic entry gate, automatic generator, laundry, hot tub. There are motion activated security cameras and lighting around the property. There is a long-term tenant in Blue Serenity’s Cottage, on the acreage. However, the stone walls surrounding the front of Blue Serenity’s Main Villa and new Bedroom Pavilion provide almost complete privacy at Blue Serenity. The tenant has his own electronic gate and driveway, apart from the villa’s main entry. You will probably never see the tenant unless you run into him outside while getting in or out of your rental car. Your privacy at Blue Serenity is completely assured! RENTAL RATES FOR BLUE SERENITY: The basic rental rates quoted for Blue Serenity are based on 3 bedrooms in the Main Villa (which can sleep up to 6 persons). Then add 1 or 2 more bedrooms in the new Bedroom Pavilion for 7 to 8, or 9 to 10 guests. You may sleep up to 10 guests total at Blue Serenity. Rates do not include: tax of 12.5%, island charges of $300.